This Saturday, a session of the Security Council of the United Nations (UN) was held due to a request from the United States government, with the intention of discussing the political situation in Venezuela. 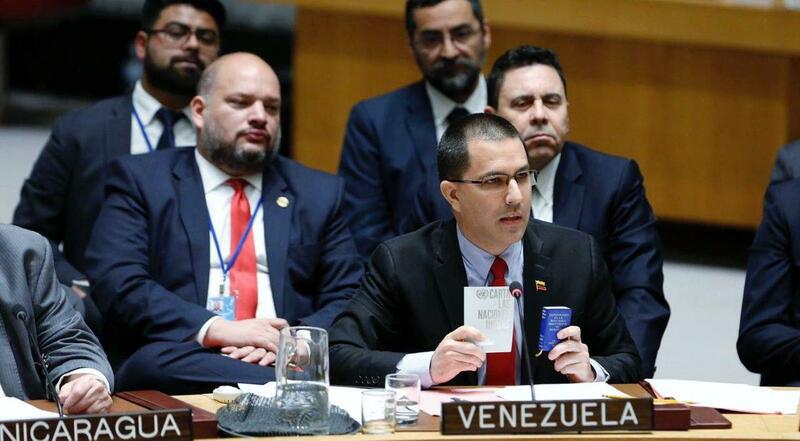 This session, on the instructions of President Nicolás Maduro, was attended by the Foreign Minister of the Bolivarian Republic of Venezuela, Jorge Arreaza, who denounced that the United States government has openly promoted a coup d’état in the Caribbean nation, placing itself at the forefront. It should be noted that the US Secretary of State, Mike Pompeo, in a unilateral action withdrew himself from this session before Venezuela had the right to speak and before the end of the session of the UN Security Council. The Venezuelan Foreign Minister pointed out that “It was Donald Trump who threatened the use of military power directly to the Bolivarian Republic of Venezuela. And this has not been questioned by the instances of multilateralism of the world, now it is intended to sit Venezuela in the dock of the defendants because its government have strictly complied with what their Constitution says”. In this sense, FM Arreaza spoke out in rejection of the new interventionist actions that have wanted to impose an ultimatum on Venezuela. Such is the case of governments such as Spain, which want Venezuela to be called to elections within eight days. “Europe is in the tail of the United States and the government of Donald Trump, giving us eight days of what? From where do you get the idea that you have any power to give deadlines or ultimatum to any nation. How do they get such an interventionist action?”Asked the Venezuelan Foreign Minister. Also, the foreign minister denounced that the international right has orchestrated a plan to ignore the free and direct elections that took place in Venezuela on May 20, 2018. “I went myself to deliver a letter to Federica Mogherini, so that the UN could observe the elections in Venezuela. But they refused, because the plan was already under way. Three months before the election, the undersecretary Sullivan was the first to say: those elections will be fraudulent. Months before the elections When have you seen that?” Arreaza said. For his part, the Foreign Minister referred to Article 233 of the Venezuelan Constitution, to refute the “constitutional varnish” that was wanted to be given to the self-proclamation of Juan Guaidó. “In Venezuela there was an inauguration, on January 10, if there is any disagreement on the part of the National Assembly, then it must go to the Supreme Court of Justice”, Arreaza said. Finally, FM Arreaza said that “Venezuela will not be Donald Trump’s war trophy. Venezuela is not alone, because it is attached to its Constitution and the Charter of the United Nations. Venezuela will not give you the war that the United States wants. Venezuela is a territory of peace”.